Democrats Pushing Us to War? Thank you for bringing attention to the geopolitical consequences of the Russia Hoax in your china-backing-russia-in-venezuela posting. I am a former engineer working on a military fiction novel involving China. While researching my book I saw troubling signs the Russian and Chinese governments reacting to this nonsense. Instead of driving a wedge between these two powers as previous American administrations since Nixon had done, the ‘Russia, Russia, Russia’ hysteria tied the Trump administration’s hands while driving the Russians into a tighter partnership with China. A partnership in which the Chinese government is all too willing to take advantage. I would hope the Vostok 2018 military exercises woke someone in Washington, but I fear the long-term damage is already wrought. With the loss on the INS treaty, hypersonic weapons coming online, and the soon expiration of the last START nuclear weapons agreement in 2010, I fear we are protruding head-long into Cold War 2.0. A more complex iteration with a powerful third player. You are one of the few whom I have seen recognize this consequence and I applaud your insight. REPLY: Yes, it is very disturbing. What the Democrats have done is really brain dead. They have set us on a course toward creating world war instead of peace, all to win the White House in 2020. Even if they captured that, the Republicans will do the same to them. Since the rhetoric has been so intense against Russia, I do fear that a Democratic president would feel that they would look like a traitor if they back down. 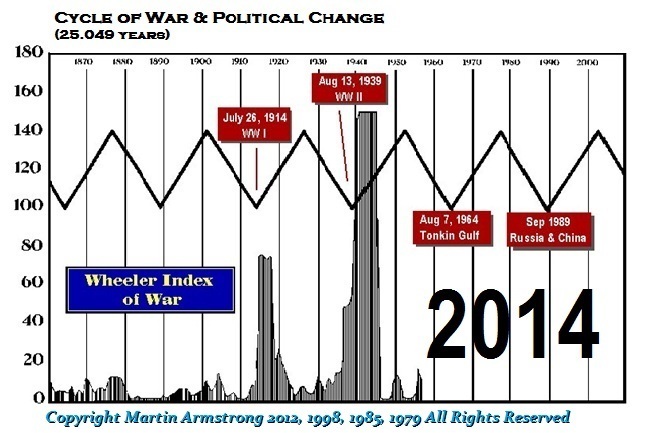 Again, our War Cycle is not something I really wish was not pointing higher. A Democratic victory in the years ahead will be extremely dangerous because they have hyped this Russian nonsense way too far.